And why should it be the theme of a tour in Germany’s inviting Franconian region? Precisely because the region is so inviting, so open to walkers, its Main River so amenable to travel by barge. To spend a week in early June in an area where history runs deep and architecture reflects the centuries, learning a technique of walking that will build your muscles and your spirits – this seems like the best of ideas. 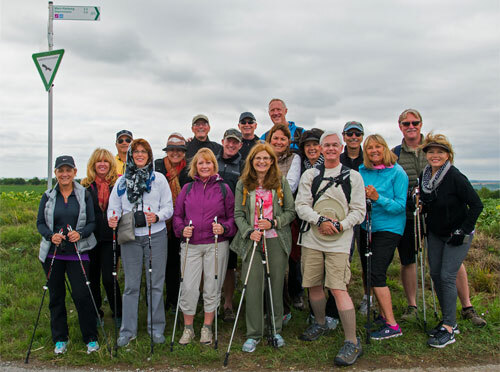 Nordic walking developed in Scandinavia, where cold weather and frequent snow encouraged the use of poles to aid in getting around. The poles also increased stamina and fitness, people noted, and they became an all-weather adjunct for many. Their use has spread far beyond the Nordic peoples. Upper body is strengthened, cardio-vascular fitness developed, stress on joints lessened. Who could object? 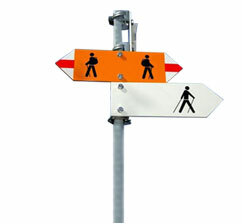 These walking poles have evolved into specially designed equipment, similar to ski poles but with individual benefits. Walkers apply force to them with each stride and use more of the body, with greater intensity, than in usual walking modes. Not to worry, a drill master will be at hand to teach you the technique. But walking is not the whole story here. How could it be, when you are in an area that has never forgotten medieval times, that is proud of its beer making wherever hops are grown and of its wine making elsewhere. Along the Main River names of towns frequently end in “burg” or “furt”: Bamberg, Wurzburg, Miltenberg; Hassfurt, Schweinfurt. 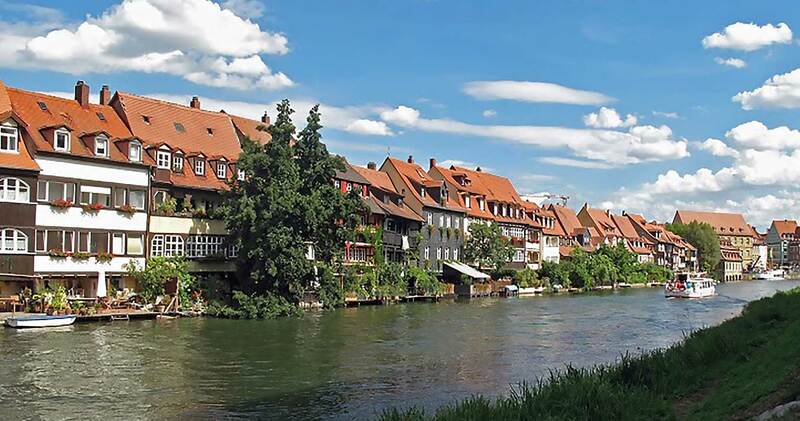 Bamberg has links to Rome, Wurzburg’s World War II destruction has been rebuilt as though it never happened, Miltenberg’s streets are seldom straight and medieval half-timbered buildings abound. 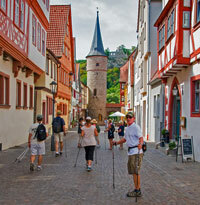 Other stops include Wertheim, where marvelous things of glass have been made for centuries. Hassfurt built an artificial island for its city hall in medieval times and has found no reason to have it elsewhere since. At Schweinfurt swine no longer ford the river, despite the city’s name, but a collection of nearly three hundred medieval knights’ coats of arms can be seen there as well as splendid late medieval sculptures by a renowned artist, Tilman Riemenschneider. In more recent times, a long term relationship with the American military following World War II has been a link between the city and the United States. Other towns where our barge will dock are Kitzingen (ask why the city’s tower is crooked – the answer includes wine in unusual circumstance) and Lohr am Main, which began in the 8th century. Time frame, in this part of the world, is sometimes unsettling. Long habitation often means a well-tempered local cuisine. Although most of our meals are aboard the barge there are also opportunities for meals ashore in towns like Volkach, where the annual wine festival is the height of the year. Pastries are a pride in this part of the world; whipped cream a staple. It’s no wonder there’s a town called Schweinfurt; pork is the meat of choice and appears in many dishes and also as bratwurst. Potatoes are a favorite (try potato dumplings) and sauerkraut a standard. All too good to not enjoy. But you’re here to walk – so enjoyment is possible without guilt! Arrival and departure from the Frankfurt Airport, with coach provided for group transfer to and from the barge.